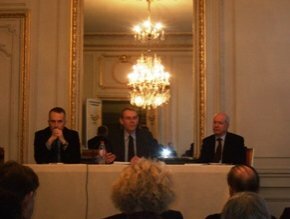 Six months after his appointment as president of the public establishment of Versailles, Jean-Jacques Aillagon organized a press conference on December 11 (ill. 1) to present the projects already underway and those planned for the future. Among the announcements, there are some positive and not so positive news. Let us start with the good news first : the excellent decision to bring indoors, finally, the group of the Baths of Apollo, for which we had recently pointed out their worrisome condition (see article in French on La Tribune de l’Art). After its restoration, the group will be replaced by a copy. Nevertheless, it is too bad that a more extensive plan for preserving the statues in the park, the one outlined by Pierre Arizzoli-Clémentel when we met with him, was not selected. Jean-Jacques Aillagon explained that other sculptures had been brought indoors in the past and gave the example of the Abduction of Persiphone by Girardon, apparently unaware of the fact that the group had been protected from inclement weather and vandalism over fifty years ago and that similar cases are rare indeed (the Marcus Curtius by Bernini, the Phlegmatic...). The condition of the latter, with its surface powdering off, is reason enough to bring these marbles indoors before they deteriorate any further. Given the fact that the XIXth century is often ignored at Versailles, Jean-Jacques Aillagon’s statement that “we should not be ashamed of the Musée de l’Histoire de France created by Louis-Philippe” is remarkable. The South wing, where the buildings have been returned by the Parliament, will house the new presentation of the XIXth century collections. The décors of the historical rooms as well as the works in them – the gallery of Battles, the hall of 1830, etc. – will of course be maintained. Jean-Jacques Aillagon thus wishes to make the museum visit more logical by clearly separating the royal apartments from the XIXth century museum. But how will the Crusades, the African and the Crimean Halls in the North wing or that of the Etats-Généraux in the main building enter into this logic ? Why not take advantage of this chance to display some of the large formats that are rolled up today ? In fact, the answer of the president of this public establishment to a question about the reserves, claiming that there was not really anything of interest, seems astonishing. If, as is the case for most museums, the reserves do not hold any masterpieces, they are nonetheless very rich in important paintings, objects or sculptures that should be replaced in the museum visit. Let us hope, finally, that the presentation of these new galleries will not be left to certain trendy scenographers. Jean-Jacques Aillagon’s statement that this was part of a curator’s role and that all of the talent needed was already in Versailles is, on this point, reassuring. Although the decision to open up the Musée de l’Histoire de France at last is very promising, its organization should be closely watched and the architectural arrangement of those rooms with historical décors that until now were not open to the public should be respected. The same goes for the North wing which will accommodate a “Musée de l’Oeuvre” devoted to the history of the Château and the gardens as well as a section for temporary exhibitions. Jean-Jacques Aillagon was right to insist on the need to provide enough bathrooms and cloakrooms for the public. All of the facilities should be available three or four years from now in the Dufour pavilion which will serve strictly for welcoming visitors, after the administrative offices move to the buildings in the Grand Commun. But could not this, real, lack of bathrooms wait for the end of the project to be completed ? 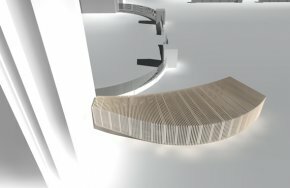 Apparently not, since a temporary structure (ill. 2) will be installed in front of the Dufour pavilion for over three years. 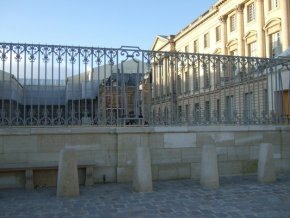 After all, it will be just another wart in the courtyard of Versailles, in this case not a permanent one, whereas the gate that is going up (ill. 3) is, alas, there to stay. Absolutely imperative repairs, some of which have already waited too long, have been confirmed, for instance the roofing on the main building or the updating of the technical systems, such as the electricity, the lighting and the heating , a must if Versailles is to avoid the fate of Lunéville. As for upcoming restorations, such as the Petit Trianon or the Ballroom in the park, no details were disclosed. Given recent history, it would be wise to be concerned about the future since the architects in charge of these projects are the same ones that carried out the previous ones. Among the other announcements, the Internet offering is notably improved, particularly in 2008 with the posting of all of the collections for the Musée de l’Histoire de France, an excellent initiative which we will certainly comment on in a future article. Several exhibitions are planned up through 2011. 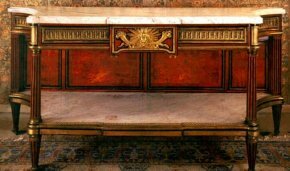 Thanks to very wise deposits by the Mobilier National, Versailles will gain a dozen objects from the château, including the screen with four panels by Georges Jacob in 1783 for Marie-Antoinette’s grand Cabinet Intérieur and which will join the rest of the furniture, currently being restored, in the room . An excellent initiative, which should be extended to other objects from the Mobilier National that would thus be reincorporated into more museums. Finally, an acquisition was announced in an enigmatic manner : « for the last one and a half years, the Public Establishment has been attempting to purchase an important piece of furniture which belonged to the First Dauphin, listed as a National Treasure.” In fact, on 10 August 2006, a console signed by Charles Saunier, commissioned in 1787 for the Dauphin had its request for a certificate to leave French soil rejected. This very beautiful piece  (ill. 4) will therefore enter the collection at Versailles, although the name of the company that acquired it for the museum has not yet been disclosed. We will conclude with a paradox : during the whole press conference, the site being discussed was projected on a computer screen thanks to the three-dimensional layout on the Géoportail website. This virtual maquette, which has just been created in cooperation with the public establishment of Versailles, shows a courtyard where the statue of Louis XIV stands out, without the mediocre modern gate called “grille royale” that has replaced it. The Neptune fountain is seen without the steel bleachers that mar it several months a year. A Versailles that has almost disappeared for posterity. — A pair of armchairs, sculpted gilt wood, delivered for the “cabinets intérieurs” at Versailles in 1775. — Sculpted gilt wood screen, Georges Jacob, ca. 1780. — Sculpted gilt wood screen, ca. 1775. — A pair of mahogany armchairs, ca. 1785, Georges Jacob, from the Grand Trianon apartments in the XIXth century. — A pair of chairs, moulded painted wood, delivered in 1786 for Louis XVI’s dining room at Versailles. — A pair of Sèvres porcelain and gilded bronze vases, delivered for Madame Elizabeth at Versailles. — A barometer of white marble, mahogany, gilded bronze and polychrome enamel delivered for Louis XVI’s library at Versailles in 1789. — A white marble and gilded bronze clock by Lepautre, delivered for the Comte d’Artois, ca. 1785. — An armchair and a chair by Jacob-Desmalter, delivered for the mill in the queen’s hamlet at Trianon, ca. 1810. — A chair by Jacob-Desmalter, delivered for the lord’s house in the hamlet at Trianon, ca. 1810. — A privy chair delivered to the Grand Trianon, ca. 1820. We found the photograph on the Connaissances de Versailles forum which announced this acquisition already on December 6th.